FLIR is by far one of my favorite companies because they make one of the most useful tools one can have in bigfooting: the thermal imager. Thermal imagers see heat and translate it to visible light so we humans can see it. Often, the pricier units translate certain temperatures into various colors, and in the black and white units, the hotter something is, the brighter is is. Thermal imagers are extremely useful for bigfooting. Clearly, sasquatches are mammals. Mammals are warm blooded and give off heat, so they show up well in a thermal imager, even in the darkness of night. So, even if a bigfoot was unable to be seen with a human eye at night, it should show up quite well in a thermal imager unless it is behind another object. thermal imager in the Portland Zoo. I regularly utilize thermal imagers in my own bigfoot research, and have developed a number of techniques for deploying them. So far, I've not been successful in capturing an image of a bigfoot on a thermal imager, but I'm optimistic that I will (or perhaps a bit stubborn). FLIR is the company that currently makes the best quality thermal imagers for bigfooting at the most reasonable prices. We use their products all the time on Finding Bigfoot. Knowing my enthusiasm for FLIR, you can imagine my excitement when the company asked me to be a keynote presenter at their annual technology conference, Inframation. I will be speaking about my use of thermal imagers in the field, how to employ them, and what we can expect to learn about bigfoots by eventually building a library of footage (thermal or otherwise) showing these amazing beings in their natural habitat. Inframation is the world's largest conference solely about the use of thermal imagers. It will be held on November 6th - 8th in Orlando Florida. (As of now, I'm scheduled to speak on November 6th, but sometimes that changes. I'll be posting more info as the date approaches.) The event is open to the public, but a bit expensive for the thermal imaging hobbyist. However, if you already work in fire fighting, surveillance, insulation, home inspection, or some other industry in which thermal imagers are tools of the trade, please come on by and say hello to me before or after my presentation. I'm always happy to talk bigfoot with friends from the bigfoot community. Be sure to check out the short promotional video I did which is featured on this page. 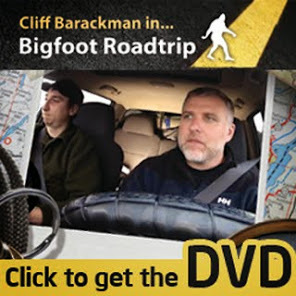 You can see some very rare behind-the-scenes shots from a recently filmed episode of Finding Bigfoot.